Capital of Messenia and port of southern mainland Greece, Kalamata is a magical holiday destination that combines everything one wants from their holidays. The beautiful town of Kalamata, built on the foothills of Mount Taygetos, in the heart of Messenian Gulf is ideal for the dreamiest summers. It is a multifaceted town that offers unlimited possibilities to its visitor and is also easily accessible either by road or by plane. Kalamata stands out for its natural beauty. Its 5 km long beach with its blue-green waters invites and seduces the visitor. From Verga all the way to the port of Kalamata it is a non-stop stretch of sea and sandy beaches. The water is crystal clear and offers itself to all kinds of pleasures: from swimming and fishing, to water sports. And all this in the shadow of Mount Taygetus, which stands imposing, with its rich vegetation, dotted with wildflowers and precious herbs and its beautiful paths waiting to be explored. Nothing is to be missed in Kalamata, so make the most of your visit. Primarily, one should not leave without having taken 100% of its energy. Visit the women’s monastery (Monastiri Kalogreon), where the traditional and renowned scarves of Kalamata are still being made today. Visit the picturesque squares with 19th-century temples. Stroll through the town’s small streets to discover its treasures: The Municipal Conservatory, the Municipal Art Gallery, the church of Ypapanti with the silver domes and the neoclassical building that houses the Folklore Museum. Get your camera ready to capture the wonderful Railway Theme Park. There you will see everything – from steam locomotives to passenger cars of all types, but also the beautiful building of the Station Master’s House, the boarding platforms and the 28-metre pedestrian bridge. The capital of Messenia offers plenty of entertainment options for all tastes. A special mention goes to the International Kalamata Dance Festival, founded in 1995 to promote the art of dance, which takes place every year in July. 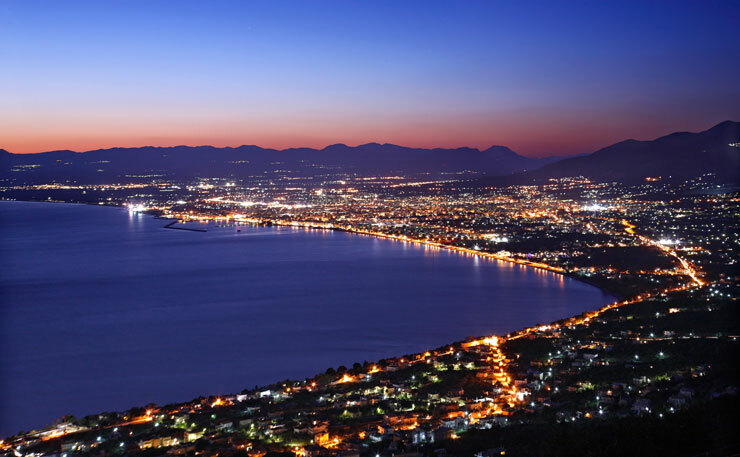 Kalamata, however, is particularly well-known for its nightlife. Start with good food in one of the many great restaurants and tavernas in the area, before you end up enjoying your favourite cocktails accompanied by your favourite music, the sounds of the beautiful city and the waves. Euripides named Messenia “Kallikarpi” which means fertile, giving good fruit, while Charilaos Trikoupis, the famous Prime Minister of Greece in the 19th century, had joked saying that if one plants umbrellas there, they are sure to bear fruit! Not unfairly, since Messenia is proud of its products and competitive worldwide. Kalamata oil, Kalamata olives, raisins, figs, all kinds of vegetables, as well as the aromatic herbs or the wild greens of the Taygetos mountain and, of course, the wine, are world famous for their quality. Now imagine all of these products harmonizing in the kitchen. In Kalamata you will enjoy local traditional pork on the spit, cod “Tsiladia” (a local delicacy with cod, raisins, onion and tomatoes), stuffed courgette flowers, olive pies, “diples” (a local dessert made of thin sheet-like dough, rolled into long, thin strips, fried and folded in hot oil and then dipped in a sugar or honey syrup), “lalagia” (a special local deep fried dough), “kayana” (scrambled eggs with tomato) with pork, smoked ham sausages with orange, sfela cheese (a local spicy version of feta cheese), as well as the local version of the coq au vin – a cockerel cooked in tomato sauce and served with traditional noodles. Flavours you will never forget and dishes to remember by their name and place of origin: The beautiful and gifted Kalamata!